The countdown to July 4th continues.. Four days! My first two America inspired looks (see here & here) were more on the casual side, so I wanted to dress it up a little bit in today's post! 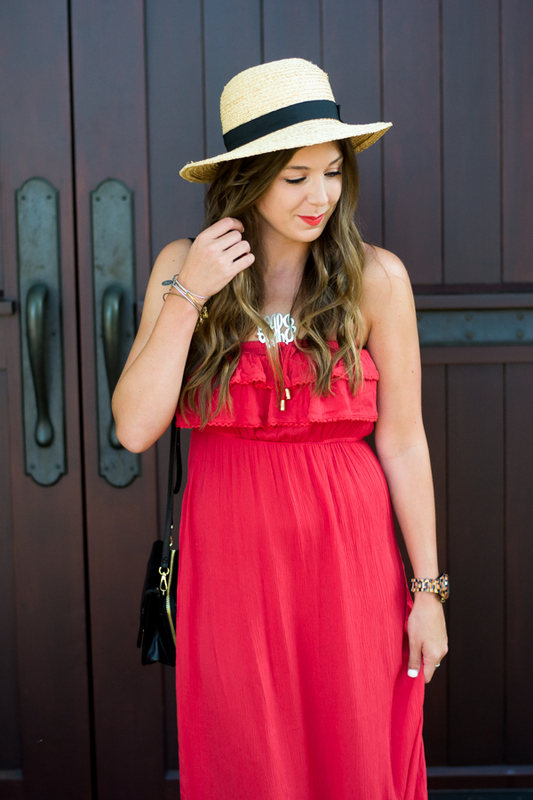 Nothing makes me feel sassier than a red dress, and this one is perfect for the fourth!! Also, my purse is under $25.. yes you read that right! Target has been killing the purse game lately! On a completely different mote: WHO WATCHED THE PRETTY LITTLE LIARS FINALE?! I watched it yesterday and have so many emotions! I need to know your thoughts! I don't know how I feel! That dress is so cute for the fourth! I love the way you styled it! That's such a great color. Love how you styled it with a hat. Great shoes too. I think red is your color! Love these fun heels! What a cute dress! It's perfect for the upcoming holiday! 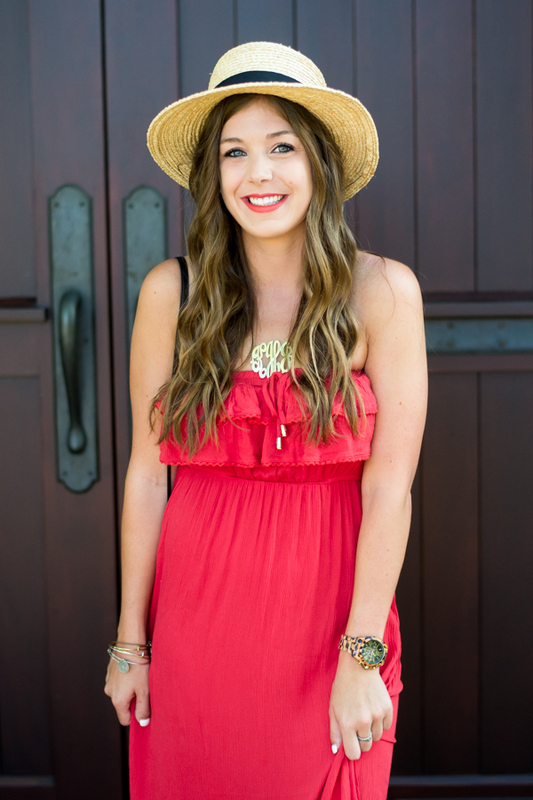 Love, love, love this look and I'm obsessed with your monogram necklace! You look so pretty in that dress. I am still catching up on the last season of PLL so avoiding all spoilers. I LOVE the ruffles on this dress. 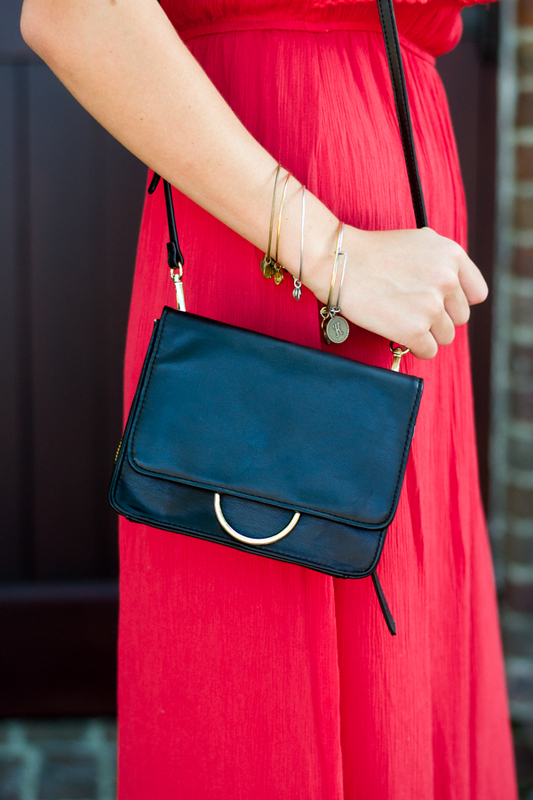 Such a cute look for the 4th of July. Also, I can't believe that purse is from Target! They are killing it with accessories. I love the color red! It's a statement piece that people will always remember. Love this fun dress paired with the leopard sandals! Happy Fourth of July weekend! Such a pretty dress and I'm loving your hat! So cute. Love this red dress and the leopard print sandals go perfectly! Hope you have an awesome 4th! This dress is SO adorable on you gal!! Omg I adore this red dress! And those sandals are the cutest print. such a cute red dress, hope you had a great 4th! Love the ruffle detail on the hem and oh my gosh those sandals are the cutest!! What a great look for the holiday! !